Show your support for DEI Thermal Tuning Products wherever you are! Take the heat out of your car – and put the Flames on your back! DEI T-Shirts are available in two different silk screened designs. 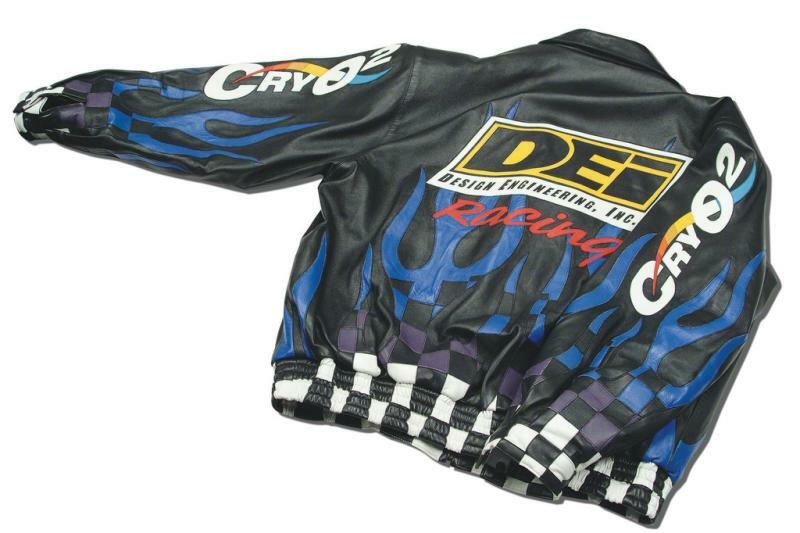 Chose from front and back DEI “Flames” or DEI’s CryO2™ logo designed T-shirt. The “Flamed” black shirt vividly displays that you are true enthusiast in tune with the need to control heat in today’s hi-performance vehicles. These high quality T-shirts are made of 100% cotton and pre-shrunk. Made of 100% leather featuring sewn-in lettering, signature flames along with DEI and CryO2 logo’s. DEI custom made black leather jackets are available in most sizes. Contact DEI direct for availability and pricing.